This film is debuting movie for the director. Reliance Entertainment presents I Me Aur Main is starring John Abraham, Prachi Desai , Chitrangda Singh and Raima Sen. I Love New Year Romantic Trailer out!! The trailer of I Love New Year is released on 25th Feb by T-Series on Youtube. The entire team of the film were there at the muhurat ceremony including Prabhu Deva, Shahid Kapoor, Sonakshi Sinha, and Krishika Lulla. Tickets for the most awaited film ‘Kai Po Che!’ has already been sold out a day before its screening at the Berlin Film festival. Bollywood director Sajid Khan is introduced his fourth movie Himmatwala in 2013, starring with Ajay Devgn and Tamannaah Bhatia in the lead roles. 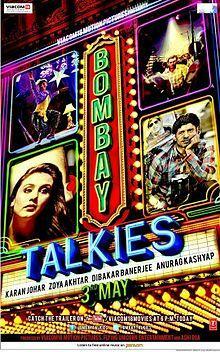 Here comes the first look of Bombay Talkies that includes four shot movies. This film is the joint venture of four famous Bollywood directors. The directors of the film are Karan Johar, Anurag Kashyap, Zoya Akhtar, and Dibanker Banerjee. All of them are well known personality in Bollywood. This sounds interesting and it’s creating curiosity among audience. After releasing the first poster, one cannot wait to watch the trailer of the movie. And the good news is that filmmakers have recently come out with the trailer of the film. This film is special as it celebrates 100 years of Indian cinema and its emotion. Viacom18Movies launched the official trailer of Bombay Talkies on yesterday. The movie features Amitabh Bachchan, Rani Mukerji. Randeep Hooda and Katrina Kaif also playing the important role. In this film, Katrina will be seen in a completely different avatar. The movie is all set to release on 3rd May, 2013. Stay tuned with our website for more updates and Bollywood Gossip. The choreographer-turned-director Prabhu Deva has started shooting for his next film named “Rambo-Rajkumar”. Shahid Kapoor and Sonakshi Sinha will be seen in lead roles. Both the actors will be sharing the screen for the first time. The complete starcasts were there in the muhurat ceremony. The complete starcasts were there at the muhurat ceremony including Prabhu Deva, Shahid Kapoor, Sonakshi Sinha, and Krishika Lulla. Sunil Lulla, who is producing this film was also present during the ceremony. The film is going to be full masala entertainer that includes action, comedy and romance. This is the very first time Shahid and Sonakshi will be acting together for the film. The recently turned director has done great work in the past to entertain the audience. We wish him good luck for his film and hope that this action-comedy flick will also garnered great response from viewers. Prabhu Deva has tweeted that "There is no stopping us and everything is going smoothly." The whole cast is in Gondal for the shooting and will stay there for another week. The unit stayed in Kutch for almost three weeks before the location for shooting were finalized. The movie is scheduled to release in November this year. We wish the entire team of the film, All the Best and loads of success and luck. Stay tuned with us for latest Bollywood Gossip. Gulshan Kumar Presents I Love New Year starring with Sunny Deol and Kangana Ranaut. Tannishtha and Prem Chopra, in other roles. Navin Chaudhary are also part of the movie. The romantic comedy movie is directed by Radhika Rao & Vinay Sapru, produced by T-Series and co-produced by Ajay Kapoor. The music is gave by Pritam and lyrics by Saeed Quadri, Mayur Puri and Sahil Kapoor. First time in Bollywood screen Sunny Deol and Kangana Ranaut are coming together. One more time will seen Sunny Deol in a romantic comedy role after the successful hit in the Yamla Pagla Deewana. The trailer shows few romantic funny moments between the two strange people who spend two days before the New Year's eve. The whole story of the movie is revolving between two strangers. Enjoy the official romantic comic trailer and stay connected with us for more Bollywood News. 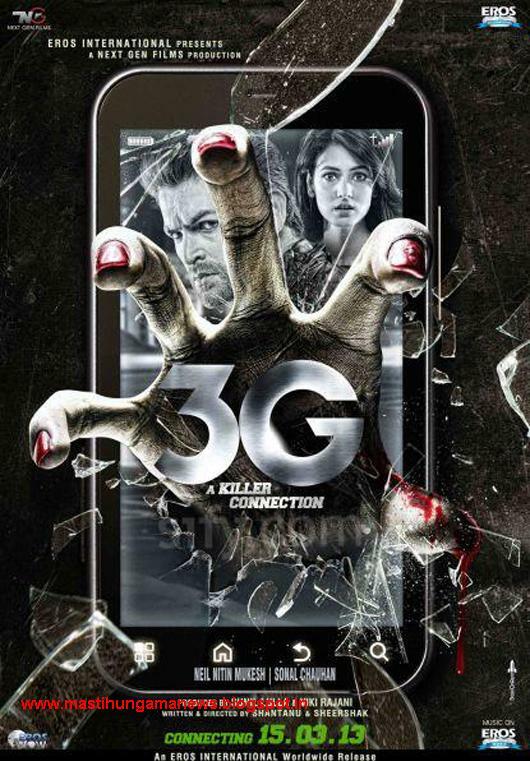 The first theatrical trailer of the upcoming movie ‘3G’ has been launched in Mumbai. The movie is a supernatural thriller. The heartthrob Neil Nitin Mukesh and the gorgeous Sonal Chauhan are playing the lead role in the movie. Both the actors are sharing screen for the first time and seems to have a great onscreen chemistry. The movie is directed by Shantanu and Sheershak. It is a Psycho horror movie that revolves around the life of Sam (played by Neil Nitin Mukesh). The movie sounds quite interesting through its first look. We hope the film does not disappoint the audience. The character Sam lives on Fiji Island along with his girlfriend Sheena (played by Sonal Chauhan) where he buys a new 3G cell phone. After this, he starts getting mysterious call from an unknown number and turns into a dilemma. Neil has come back with a new avatar, whereas, Sonal looks too much pretty. The film has a romantic song ‘Kaise bataaoon’ that will blow your minds. The movie is going to hit the screen on Friday, 15th March, 2013. After watching the trailer of the upcoming film 3G, we hope it fulfils its promise to entertain the audience. Stay tuned with us to get exciting news and updates on the Bollywood News. The movie is based on the novel ‘The 3 Mistakes of My Life’ written by Chetan Bhagat. The casting of the movie includes Sushant Singh, Rajkumar Yadav and Amit Sadh. It will be released on Feb 22 worldwide. The world premiere of the film is scheduled to be held on February 13 in the most eminent venue at the Berlin International Film Festival. The show is going to be house full as tickets were completely sold out. The auditorium consists the seating arrangement for 1600 people. Siddharth Roy Kapur, the Studios director , Disney UTV has revealed that he is glad and overwhelmed with the great response and excitement for the film. People are eagerly waiting for the release of the film. 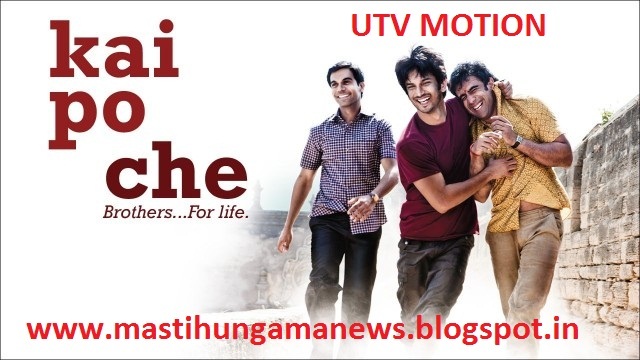 We hope that ‘Kai Po Che!’ becomes the biggest hit and earn well to reach at the top of the box office.